Farmers markets are a great place to find the freshest vegetables and fruits to eat on your restricted diet. I recently got some amazing bargains at the local Evanston Farmers Market, quite by accident, as I was there at the end of the day and found farmers discounting produce rather than packing it up to take home. I bought three immense cucumbers for $1. And I bought some amazing tomatoes for $1.50 a pound. I had so many of each, I needed to do something so they wouldn’t go bad before I could eat them. 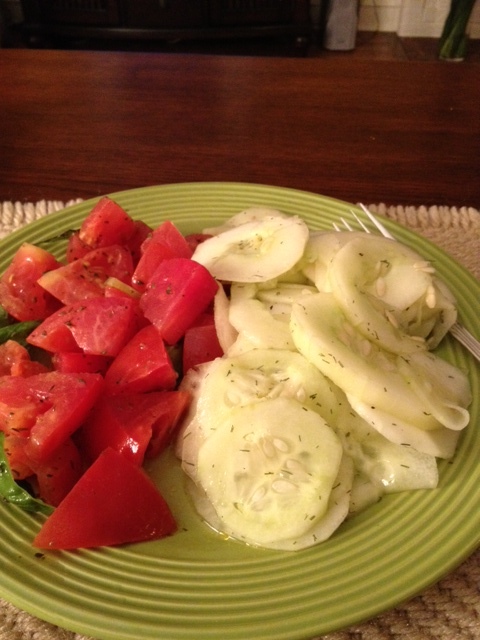 The answer was to make a cucumber salad and a tomato salad. My dinner one night, two great summer salads.